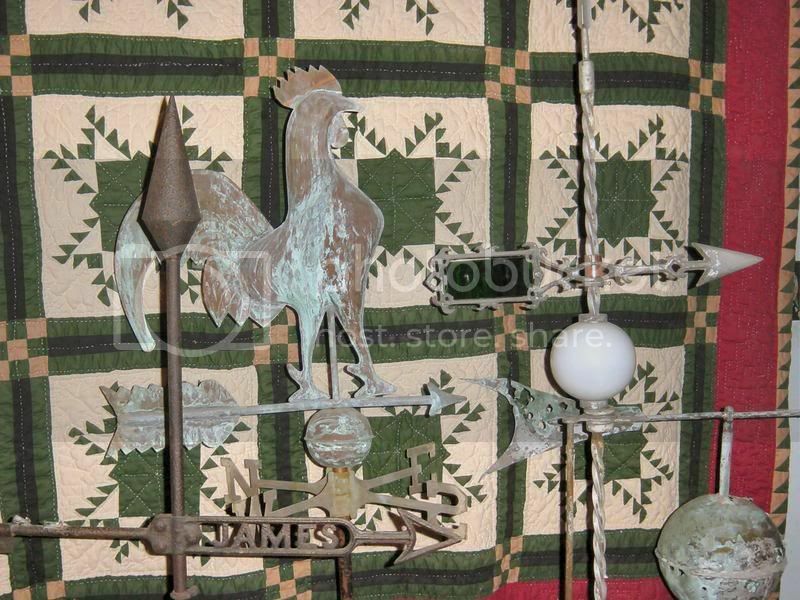 WEATHERVANES -We have managed to collect a number of weathervanes from various barns. 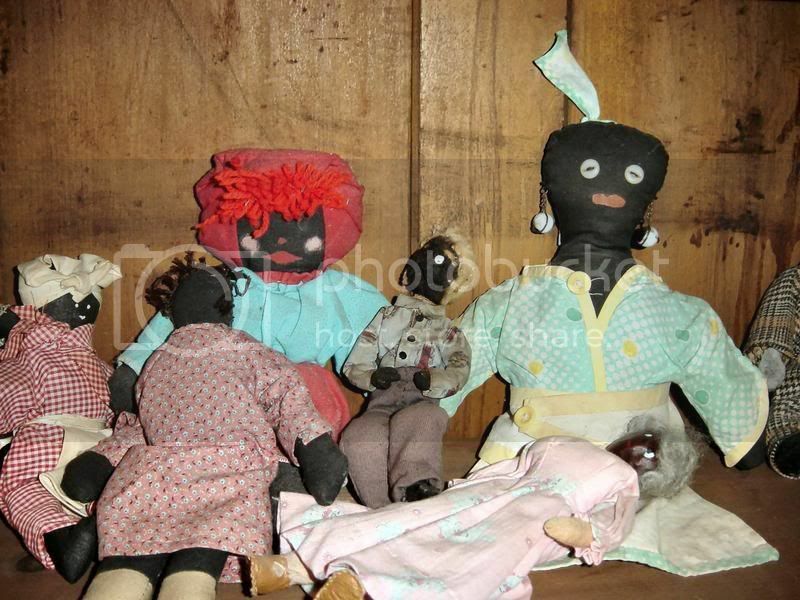 They where much more important on farms before t.v. and radio weather forecasts. Farming is so linked to the weather that any thing you could do to try to figure out when the next rain or snow is coming would be of vital help. Knowing which way the wind is blowing really helps forcast. Many farms also had a barometer and quite a few farmers claimed a good case of arthritis, which would cause their joints to ache when the weather was changing, could also be helpful. Several of the vanes we have are full of bullet holes, apparently a popular, if dangerous, past time. This wagon was used in Akron. It was acquired at auction by a gentleman in Stow. He stored it in his garage for decades until finally his wife insisted they had reached an age when it was more important to park their car inside. Years of scraping snow off the windshield had taken its toll. He donated the wagon to the museum a number of years ago. The store is long since gone and its owner is not known. The Karasec farm building was finished being re-erected in late Sept. 06. It is the new home of the Vaughn Loom and Weaving Mill. 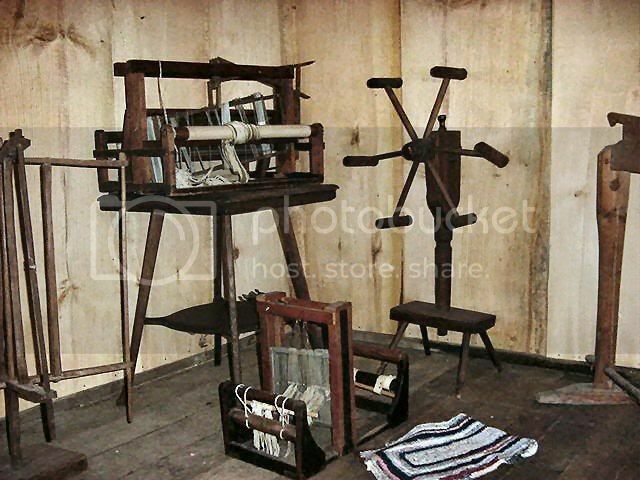 The various looms and weaving equipment are still being moved into the building in this picture. 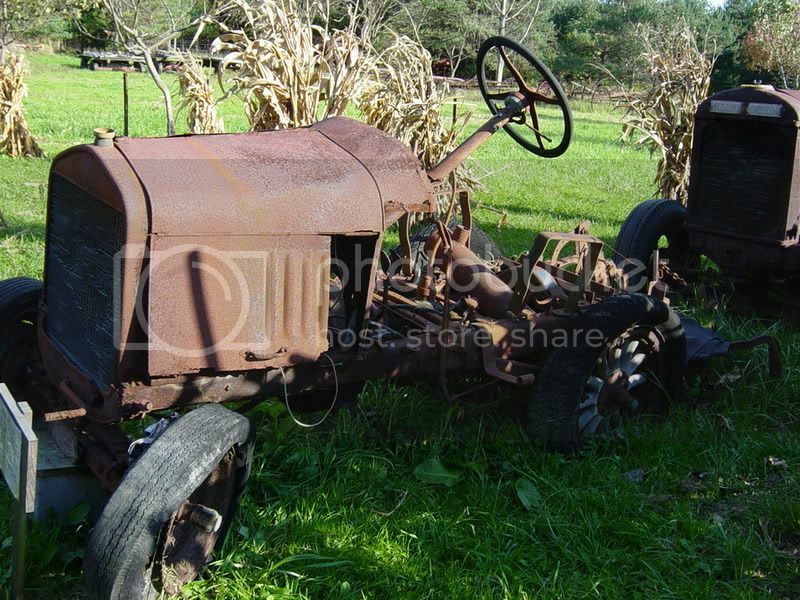 In the early 20th Century, it was common for farmers to convert old cars or trucks into homemade tractors. This tractor was made from a 1923 Model T pick-up truck. The Ford transmission was replaced with a two-speed Chevrolet transmission. The tractor was last used by Emery Reitz in 1969 to plow a garden in Copley Twp. Sum. Co. 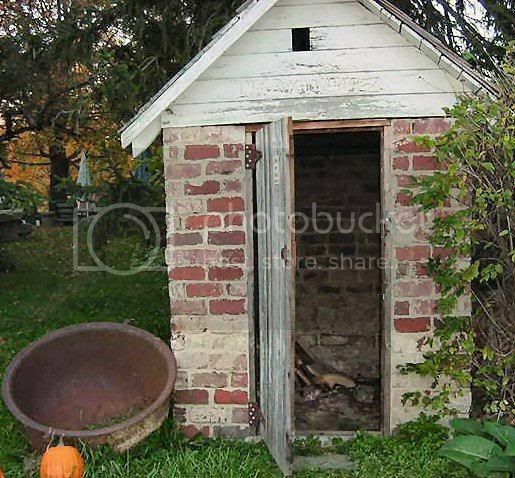 It was then left standing in the back yard until acquired by the museum in 2005. It will be put back in working order and restored soon. In 1900, there were 100 cigar factories in Ohio that hand-rolled their cigars. By the end of W.W.II only 40 were left. The Blaine-Stewart Factory originally located in Hicksville, Ohio was the last operating in the state. When it closed itâ€™s doors in the early 1970s, most of its equipment was 100+ years old. These are a few of the washing machines in the domestics collection of the museum. 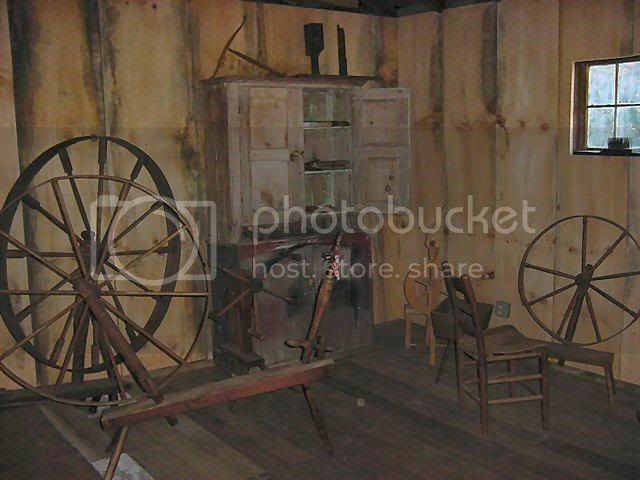 The wooden one on the right was made by Buckeye Churn Co. in Sydney, Ohio. This is an interesting example of a company trying their hand at converting one product into another use. It was saved from becoming an outdoor flower planter, -another rare piece of equipment nearly lost to history. 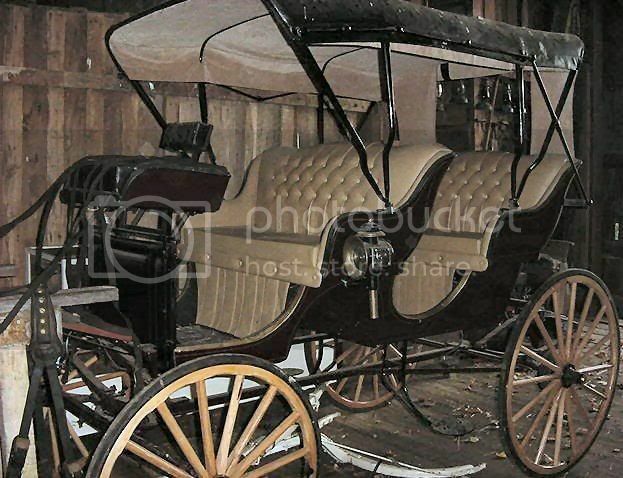 ~The surrey was donated to the museum by a very fine gentleman who lived on Streetsboro Rd. in Richfield. Unfortunately, …several years later the very persistent (and horrible, imho) owner of Pick and Save Apple Orchard in Hinckley, Ohio came by repeatedly to beg to borrow the surrey for very short term use at her orchard. I finally said she could use it for just that season. When I asked for it to be returned, she refused. Because I had trusted her to return it, I had not asked for or received a written use agreement from her. When she refused its return, the Summit County Prosecutor said there was nothing her office could do. It was quite an awful loss to the museum by the very dishonest (imho and by experience) owner of Pick & Save Apple Orchard of Hinckley, Ohio. The surrey was valued at $5,000. I got nothing in return, except for a lesson I did not want. –Don’t trust untrustworthy people. Sitting on the ground next to the smoke house is a large kettle used to scald a butchered hog to prepare it to remove its hair with a hog scraper. Much of the butchering in Richfield was done at the the Eastwood/Rooy Slaughter House. Before Harry Eastwood died at age 99 several years ago, he talked about remembering when he was a little boy and his dad building the slaughter house. Harry said he thought the wheel came out of a factory in Cleveland and his father cut and skinned the tree from their farm. After fixing them together to make the windlass, his dad hung it up in the buildings rafters so that it would turn freely on homemade wooden bearings. He then mounted an old hand crank winch on the floor and turned the winch to pull the rope to turn the wheel to turn the tree to wind the rope and raise the animal into the air so it was easier to butcher. The Firestone Tire & Rubber Co. in Akron, Ohio had its own in-house print shop, which produced the various flyers, brochures, circulars and forms used by the company. John Casto worked for many years in the shop setting the lead type and running the letterpress printing press. When the company made the switch from the several hundred year old technology of hand set printing to todays copy machines, John retired. Firestone allowed Mr. Casto to take the press, type and cabinets and related tools with him. John set up his own shop and for many years printed wedding invitations, business cards, fancy dinner napkins and ect. for his many happy customers. When Mr. Casto passed, his family donated his equipment to the museum. The Museum is now home to three Chandler & Price letterpresses, several early mimeograph machines and smaller table top letterpresses, a GEM floor model paper cutter, many early typewriters, almost 60 drawers of various fonts of type and many other printing tools. The shop is available for use by the public. Babb’s Orchard was originally a dairy farm located at the corner of Hawkins and Broadview Rds. in Richfield Twp. When the farm became an apple and peach orchard, the Babbs converted the dairy barn into a sales room and giant refrigerator. They removed the milking stancions and feed troughs, bricked up the windows and filled the walls and ceiling with sawdust for insulation. They then installed an ammonia run cooling system to keep their many hundreds of bushels of fruit and hundreds of gallons of cider cool. 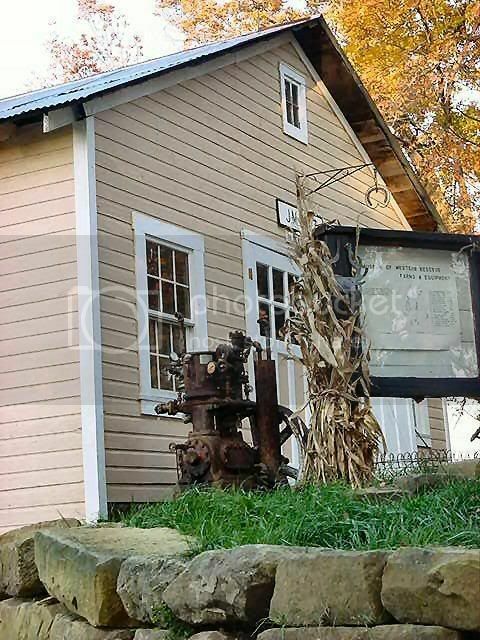 The ammonia was pumped by the compressor which now stands in front of the Hotz Blacksmith Shop, where it is often confused with a steam engine. Every fall, the orchard gave employment to many local youth (often a first job) and drew people from all over the region to its doors for its exceptionally flavorful produce. Very few of the trees still stand and most of the land has been sold to developers. The barn is now, sadly, falling into disrepair. The orchard is much missed and is fondly remembered by its many visitors. The Frase farm was located in Grangerburg in Medina Co. 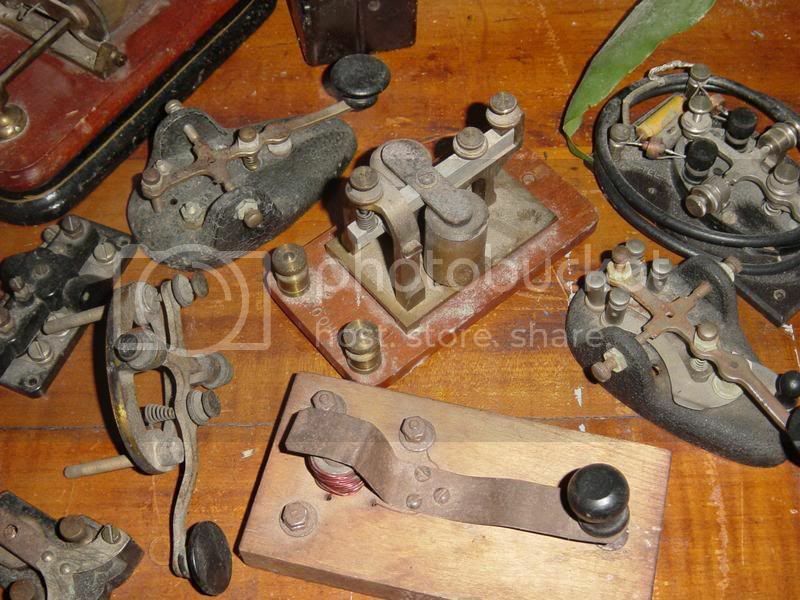 Some of the first equipment the museum collected, many years ago, was donated by Mr. Frase. He was concerned that the equipment he had used for so many years would be scraped with his passing. He wanted to see it saved so those in the future could see some of the once common tools of American farm life. I will never forget the morning I went to his farm to begin picking up his many tools. Mr. Frase had tears in his eyes. He told me that he had not been able to sleep the night before. 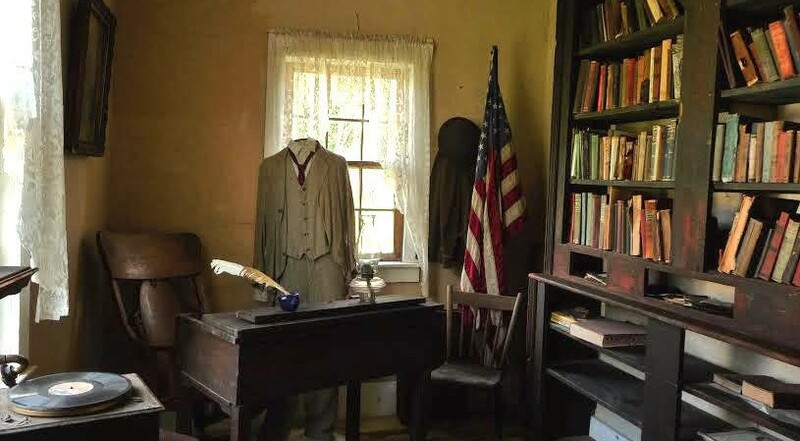 He wanted his equipment preserved by the museum, but, by donating it, he was for once and all giving up farming and giving up what he had done most of his life. It was a very emotional and hard moment for him. (I found this to be true with many of the old time farmers I have met in this effort.) Among Mr. Frase’s prized tools was his fanning mill. These mills were common on nearly all farms at one time. They were used to clean and separate seed before the advent of combines. 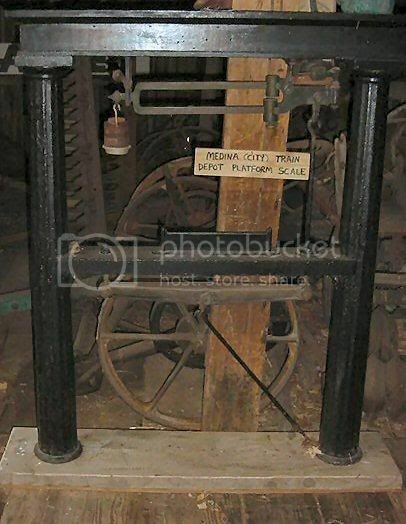 As Mr. Frase grew older, it became harder for him to handcrank the mill. He removed the crank and replaced it with a pully and v-belt driven by an electric motor. He continued using the mill as long as he farmed. 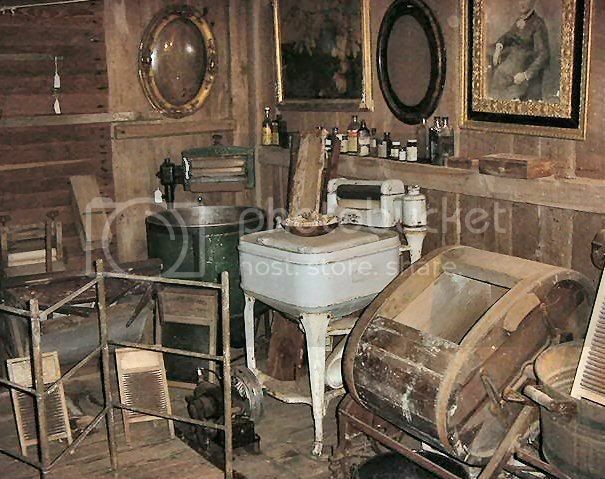 His fanning mill resides among the museums large collection of many different styles and types of fanning mills. The Chaulfield family owned shipping on Lake Erie at one time. They lived on two farms on either side of a particularly beautiful valley that forms the dividing line between Medina and Summit Counties. In front of each farm there still remains a giant boat anchor the family had placed there as a sign of the family enterprize. Many years ago we were told a story that every morning Grandma Chaulfield would go out to her front yard and wave to her daughter on the other side of the valleyâ€“quite a distanceâ€“to let her know that she was o.k. Before Richfield and Hinckley Twps. enjoyed the benefits of electricity, the Chaulfields used mechanically driven water pumps. The water pump from the farm which fronted on Medina Line Road, is especially interesting. 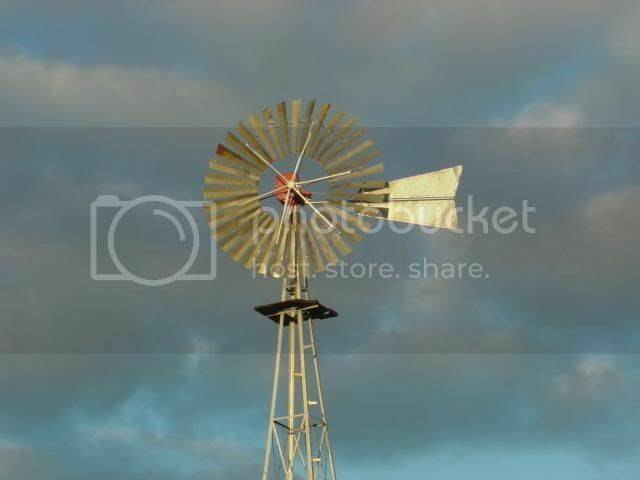 It has a shaft on top so it could be driven by a windmill, a handle on its side so it could be hand pumped and a flat-belt wheel so it could be driven by a gas or hit-or-miss engine. The Museum has a collection of over 60 water pumps from as many farms. The Chaulfield pump is the only one we have (or have even seen) that is capable of all three methods of being powered. 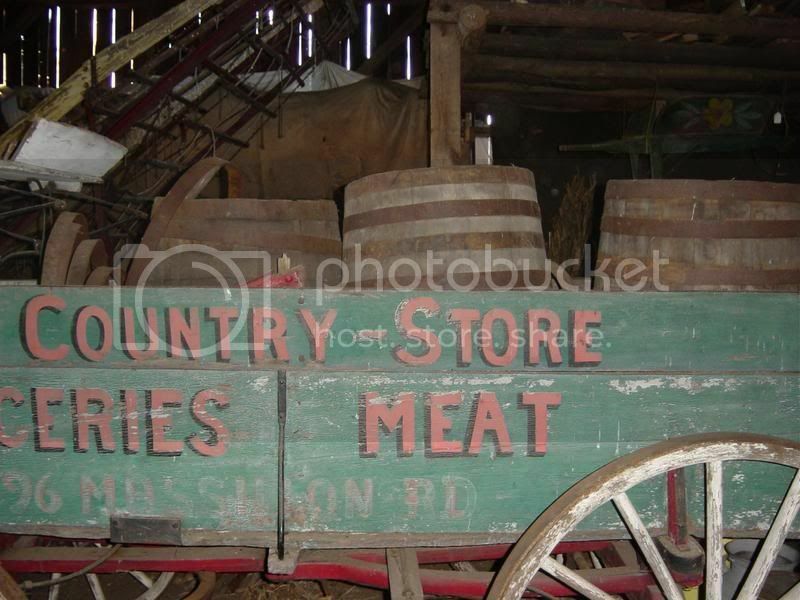 The Museum has a collection of various styles and types of buggies, surreys, hacks, carriages and grain wagons. Two of the buggies are thought to have been manufactured at the Jaeger Buggy Shop in Bath, Oh. and the two wheeled delivery cart traveled the streets of Akron carrying groceries for shoppers at Sheckner’s Market. The Birch Run buggy is an especially nice looking buggy that was made very light so as not to tire the horse. It would not be suitable for farm work or heavy hauling, but for a fast trot to the neighbors or a quick trip into town it was ideal. Shown sitting on the single seat of the buggy are Issabella and Anna who are visiting the museum from their respective homes in Cuyahoga Falls and Connecticut. The Weymouth barn is said to be the oldest barn in Granger Township, Medina Co. 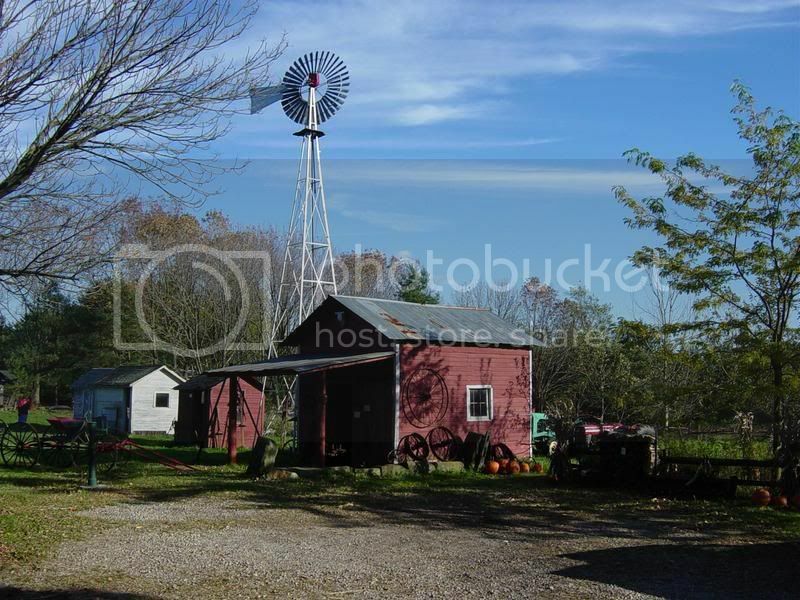 The property that the barn stood on was recently sold and the new owners wanted to tear the barn down. The local historical society objected because of the antiquity of the building. The compromise was to donate the barn to ‘The Museum’. We have dismantled the barn and have moved it to our site and plan to have a barn raising this October. While some in Granger believe this is the oldest barn (still standing), it clearly was partly built with beams from perhaps as many as two other even earlier, long since gone, barns. The barn contains beams cut from a wider than usual number of trees including sycamore, walnut, poplar and oak. The siding is pine. The beams are mostly hand hewn in several different sizes and possibly by several different hands, another sign that the barn was, in part, assembled from earlier barns. Several sawed beams were also used. When barns were built, they were built to last. For some of the beams in this barn to have come from earlier barns probably means that those barns must have been -really- old in order to have fallen out of use enough to no longer be needed or in disrepair enough to warrant their dismantling. The original Garman farm was about 200 acres, two barns, several outbuildings and a very large chicken coop. Howard and Julia lived in the most modern house, (built about 1900 in a “country” Victorian style) and their sons Charles and Ted lived in the two houses next door. Charles house was built just after The War Between the States. In the 1980’s the current owner of the house disassembled the 160 yr. old “Funka” house (which had played a roll in Summit Co’s. last capital punishment murder case, for which the defendant was hung)Â and added it to the back of the original house. He later added another addition, using flooring,cupboards and other parts fromÂ a 150 yr. old house in Navarre. The latest addition now serves as the kitchen. Charles Garman’s house is the temporary home of a number of the museums collections. As more historic buildings are saved and restored, the various collections will have their own more accessible display areas. At the turn of the century (actually two turns ago) there were about 100 hand made cigar factories in Ohio. By WWII there were 40 left. The Stewart-Blaine Cigar Factory in Hicksville, Ohio was the last operating hand rolled cigar factory in the state. It finally closed it’s doors after about 100 years of business in the 1970’s. 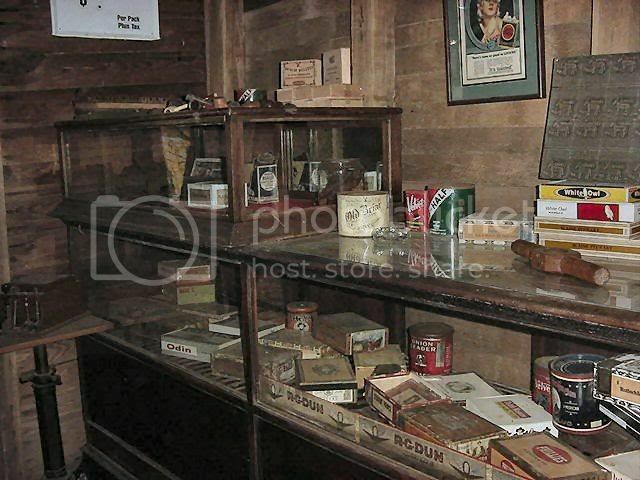 The Museum is fortunate to have acquired the equipment, which remains in excellent condition after 100 years of use, and the remaining tobacco. As time permits, we will grow a variety of tobaccos and visitors will be able to stop by and and try their hand at this once very popular and highly practiced and valuable craft.